The Alaskan Malamute is a large, strong Arctic dog with a thick, coarse double coat and a plumed tail held over the back. It is a ponderous dog, well built, with a solid body, wide head, and a proud expression. The feet are furry and have tough pads. It has erect ears and small, dark, almond shaped eyes. The eyes are obliquely placed in the skull. Eyes are brown, almond shaped and of medium size and look like those of a wolf, but with a sweet expression. Dark eyes are preferred. Blue Eyes are a Disqualifying Fault. The coat averages one to three inches in length and comes in white, black & white, wolf gray, wolf sable red undercoat with dark gray outer coat,, or red, often with darker highlights and sometimes with a dark mask or cap. The legs and muzzle are almost always white. In some areas, dogs may be either smaller or larger than the official standard. The Alaskan malamute is powerful, independent, strong-willed and fun-loving. Its idea of great fun is to pull a sled or cart, but it also loves to run and roam. It is family-oriented, and as long as it is given daily exercise, it is well-mannered in the home. Without proper exercise, it can become frustrated and destructive. It is friendly and sociable toward people, but it may be aggressive toward strange dogs, pets or livestock. Some can be domineering. It tends to dig and howl. The Alaskan malamute loves cold weather and especially loves to haul a sled through the snow. 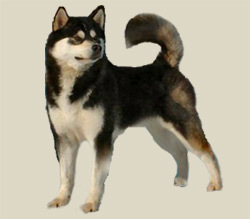 It can run for miles and needs to have adequate exercise every day, either in the form of a long walk on leash or the opportunity to run or mush. It can live outdoors in temperate to cold climates, but it does better inside during warm weather. Its coat needs brushing once or twice a week � more often when shedding.